OpenSignalMaps has just released a very insightful report visualizing Android fragmentation, which is a great value add to my previous article on Android Fragmentation. The report clearly shows that despite the numerous number of players in the industry, Samsung, backed by its marketing prowess, has dominated the OEM market share. Following Samsung, we find all the usual suspects like HTC, Motorola, LG, ZTE, etc. The challenge here is that some devices seem to have been registered by their carrier brands. It also highlights what I've always maintained, that hardware fragmentation was necessary to gain critical mass in developing economies. These markets will most likely drive the future growth of the mobile technology industry. 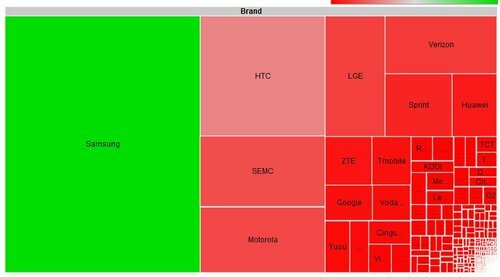 The picture seems to be of Android market share by manufacturer. I think fragmentation is a poor choice of words. That's just one of their charts, but I largely agree. Sadly, there are a lot of people who attribute OEM diversity to hardware fragmentation, which is actually a positive. This is also completely US-centric data. Fu*king yanks thinking they're at the center of the universe again.